CK Eternity Intense for women is a fresh, exciting and floral fragrance. 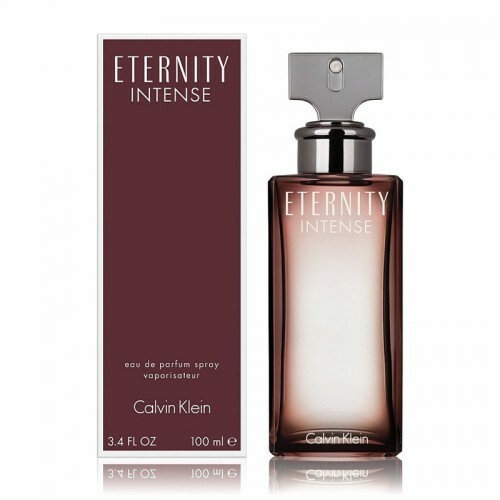 CK Eternity Intense 100ml. EDP Calvin Klein calls for love that has developed into something much stronger, in a passionate and unbreakable bond. It is an indescribable and passionate relationship that is triggered by the delicate sense connection that creates a sensual precious iris. Calvin Klein Eternity Intense Calvin Klein is based on the exciting mood of the cult original by the vigorous explosion of water plants. The base of vanilla crystals lends the scent of irresistibility and complete addiction. The intense, sensual, iris-inspired heart deepens the feeling of femininity and elegance and guarantees the overall impression of deep desire and lasting passion. Calvin Klein Eternity Intense re-evaluates the legendary design of Eternity Calvin Klein flasks with a ragged, step-by-step gradient that adds a new degree of intensity to the vials. The Calvin Klein Eternity Intense perfume water bottle is brought out in dramatic shades of crimson red. The vibrant color from the center of the bottle creates both depth and volume. Calvin Klein Eternity Intense perfumed water for women was launched in 2017. Eternity Intense is a fresh, exciting and floral fragrance.